The pentagram is an ages-old symbol that remains a powerful and popular emblem, even today. The Pentagration Ring features the traditional pentagram with a twist, evoking a modern style while staying true to its roots. 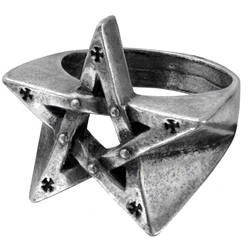 At its core, this ring is still a tried and true pentagram, featuring the five-point star design that features within its core the five lines that make up the interior of the star. The similarities end there, though, as this pentagram has impressive little crosses engraved at each of the five points, adding another layer of complexity to the style of the symbol. Small rivets adorn the central lines of the pentagram as well, giving it a new-age, industrial look that is perfect for a more modern generation. The ring itself is made from fine English pewter that is designed to possess a rough and rugged look. The ring is available in several sizes. This icon of power is a traditional staple for anyone with an interest in the occult, and even today, it remains a potent symbol that represents dozens of different concepts and groups, making this Pentagration Ring an excellent choice for any gothic guy or girl who might just want something stylish and new to add to their attire.